The bass guitar has come along way since it was introduced. There are many choices to choose from, a couple of bass guitar options for the beginner include the electric bass version which is normally a solid body and looks alot like the standard electric guitar. The acoustic bass version which is a hollow body much like an acoustic guitar. Both styles of bass guitars are available in many entry level choices. Fender, Washburn, Squire, Ibanez are just a few that offer a great line for the good cheap bass guitar. When I say cheap bass guitar I don't mean cheap, I mean a good deal for a bass guitar at a cheap price. Check out http://www.playbasseasy.com/the-cheap-bass-guitar.php and the links there for some of the best deals. 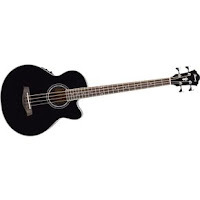 The acoustic bass and the electric bass each have their own distinct sounds. So it all depends on what kind of sound your after. To play bass easy, there are some very easy methods to learn the basic notes, scales and patterns to get started without being very complicated or frustrating. To get started my recommendation is buy a bass online lesson program. They are very much worth the small investment it takes to get started, and even if you only learned a couple of things it was still cheaper than taking lessons from a live instructor. If you are a beginner bass guitar player then http://www.playbasseasy.com/ might help with some ideas on what kind of bass guitar to play. A good cheap bass guitar in price only not in quality, can be found easier than you think. All you have to do is look at the name first because all the big names also make entry level bass guitars " cheap bass guitar" at a lot lower prices. Most of the time if you are looking at an entry level fender bass guitar chances are that it is of decent quality and totaly playable. Do the homework on the guitar, read reviews, read the specs on a more expensive bass guitar and then read the specs on the one you are interested in and see if any of the spec are the same like the material of the fingerboard or what kind of wood it is made out of or what kind of tuning hardware. Check out the links at http://www.playbasseasy.com/ and start checking out specs and reading info.